Instantly add the power of fluorescence detection to any DeNovix DS-11 or DS-11+ Spectrophotometer. 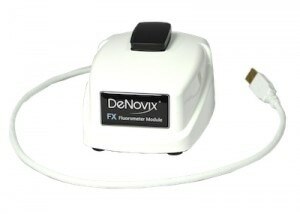 Simply plug in this USB powered accessory and DeNovix fluorometric EasyApps® are immediately enabled. The easy-to-use apps are preconfigured for use with a wide choice of commercially available assays including those designed for Qubit® and QuantusTM platforms.